Golden Arrow Resources Corporation is an exploration company earning production income. The Company has a successful track record of creating value by making precious and base metal discoveries and advancing them into exceptional deposits. 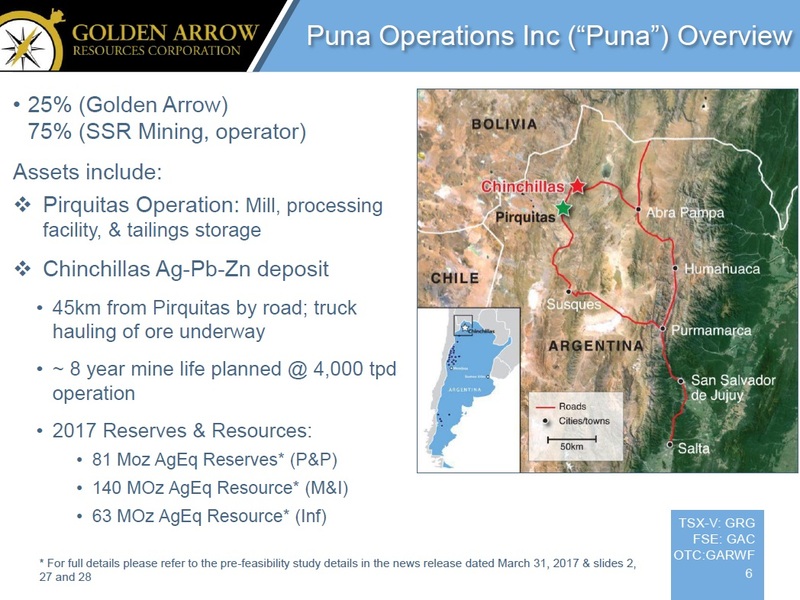 Golden Arrow owns a 25% share of Puna Operations Inc., a joint venture operated by SSR Mining, with more than eight years of forecast production and upside potential at the Pirquitas-Chinchillas silver mining project. 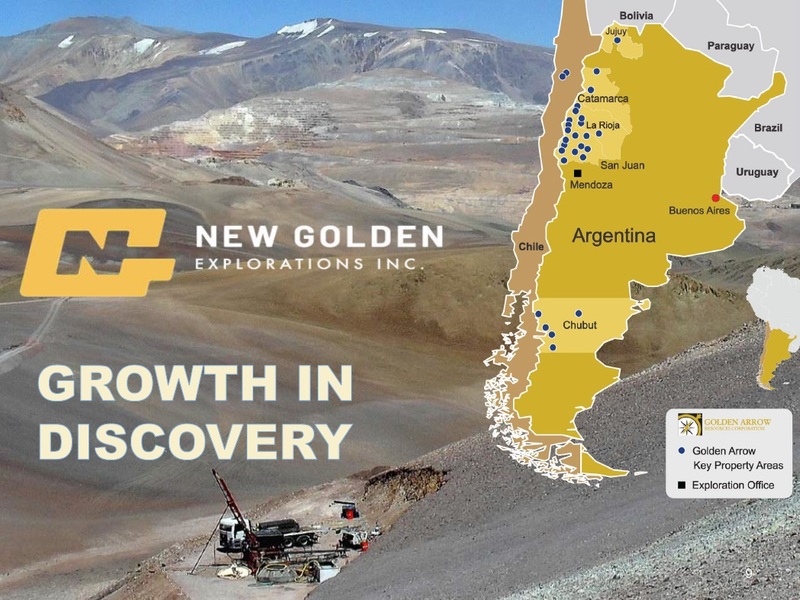 Golden Arrow is actively exploring a new portfolio of advanced projects in Chile, as well as other targets within its portfolio of more than 200,000 hectares of properties in Argentina. The Company is a member of the Grosso Group, a resource management group that has pioneered exploration in Argentina since 1993. Golden Arrow is currently on track to deliver exceptional growth in value for its shareholders. Despite the current softness in the mining markets, the Company has been busy executing on a strategy that is delivering value on two fronts: production and exploration. After successfully completing the combination of the Company's Chinchillas silver deposit with SSR Mining Inc.'s production plant into a new entity, Puna Operations, Chinchillas remains on track to go into full-scale commercial production before the end of 2018. This combination that utilizes the existing operation plant represents tremendous savings in capex (capital expenditures) and time to production. The Chinchillas integration remains on budget (see SSR Mining's news release dated Nov. 8, 2018), as most of the capex has already been paid. For the balance of costs, Golden Arrow is fully financed to meet this obligation through its credit agreement with SSR Mining. 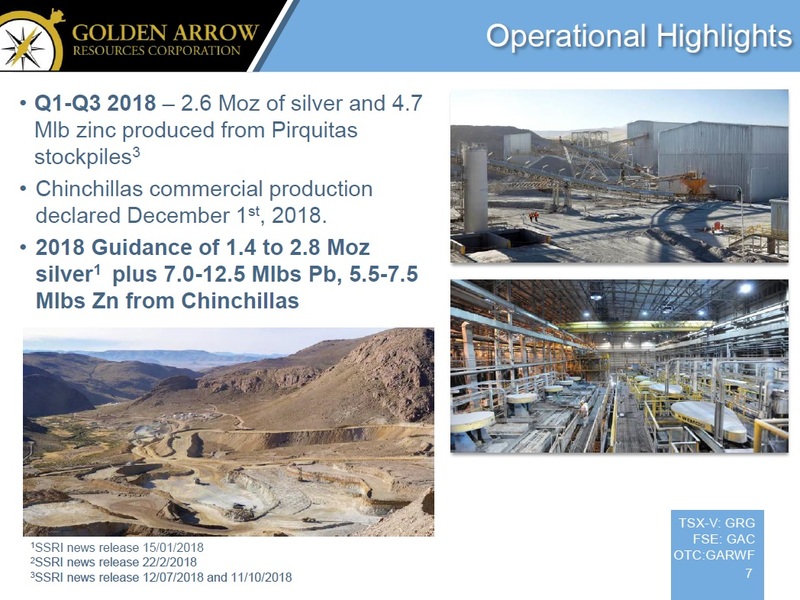 On December 3, 2018, Golden Arrow Resources Corp. announced thatSSR Mining has declared commercial production at the Chinchillas mine. 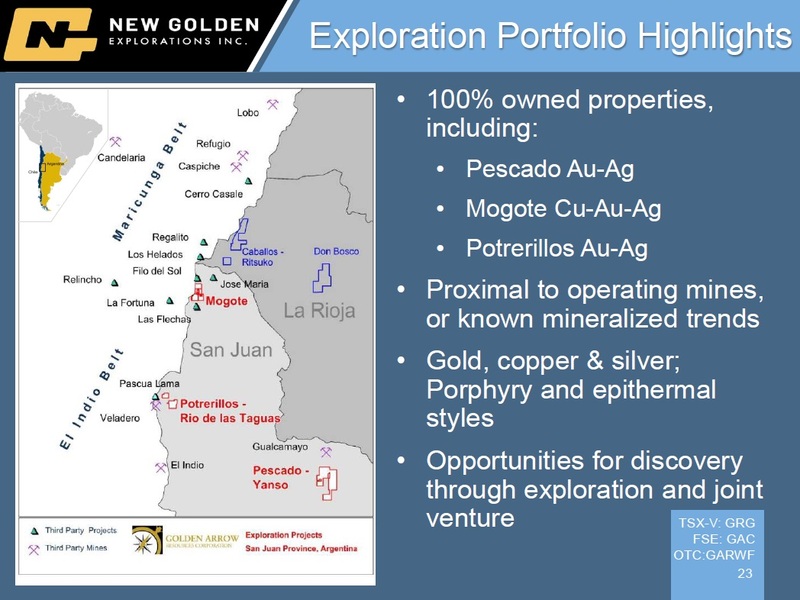 Golden Arrow's 100-per-cent-owned exploration subsidiary, New Golden Explorations, has been focused on acquiring advanced-stage exploration projects with the potential to deliver sizable added share value. After extensive review of many prospects, the Company has recently announced the acquisition of the Indiana gold-copper and the Atlantida copper-gold projects. Both of these projects are capable of quickly defining and increasing their respective resources. Funding to advance New Golden is being sought through venture capital and private equity funds. This financing would be directly into New Golden. Because of Golden Arrow's recent acquisitions and its plan to continue reviewing potential additional projects, the Company is reviewing Golden Arrow's future financing requirements. Earning Production Income via 25% of Puna Operations Inc.
Building new resources via 100%-owned New Golden Explorations Inc.
Mr. Grosso was named Argentina's 'Mining Man of The Year' in 2005. His knowledge of Argentina was instrumental in attracting a premier team which led to the acquisition of key properties in Golden Arrow's portfolio. He is the founder and president of Grosso Group Management Ltd.
Mr. Urquhart is a Chartered Accountant with more than 10 years of experience. Mr. Urquhart is presently engaged in public practice accounting offering CFO and accounting services to TSX Venture Exchange listed exploration companies in the Vancouver area. Mr. McEwen is a professional geologist with more than 30 years of exploration and production experience in open-pit and underground mining projects and operations. The extent of his experience is global in managing numerous projects in Canada, US, Europe, Asia, Africa and throughout Latin America. Mr. Cacos brings over 25 years of management and advisory expertise in the mineral exploration industry. He has worked with Grosso Group since inception and serves as senior level executive for all the member companies. Ms. Norman is a senior corporate officer with over 18 years of experience within the public company sector providing Corporate Secretarial and Regulatory Compliance services. On April 01, 2019, Golden Arrow Resources Corp. reported the TSX Venture Exchange has accepted for filing documentation with respect to a non-brokered private placement announced Feb. 12, 2019. Number of shares: 15,804,012 shares. Purchase price: 30 cents per share. On March 22, 2019, Golden Arrow Resources Corp. announced that it has closed the final tranche of a non-brokered private placement through the issuance of 3,462,034 units at a subscription price of 30 cents per unit for aggregate gross proceeds to the Company of $1,038,610. In total, the Company issued 15,804,012 units for aggregate gross proceeds of $4,741,203 in this private placement. On February 22, 2019, Golden Arrow Resources Corp. announced that it has closed the first tranche of a non-brokered private placement through the issuance of 11,051,611 units at a subscription price of 30 cents per unit for total gross proceeds to the Company of $3,315,483. On February 21, 2019, Golden Arrow Resources Corp. announced that due to strong demand in Golden Arrow Resources Corp.'s previously announced non-brokered private placement financing of units, the Company has increased the unit offering to up to $3.6-million in total gross proceeds. All other terms of the financing will remain the same. On February 12, 2019, Golden Arrow Resources Corp. announced that it has arranged a non-brokered private placement financing of up to 8.5 million units at a price of 30 cents per unit for gross proceeds of $2.55-million. On December 3, 2018, Golden Arrow Resources Corp. announced that the Company's joint venture and operating partner in Puna Operations Inc. at the Chinchillas Mine in Mexico, SSR Mining has declared commercial production at the mine. On November 14, 2018, Golden Arrow Resources Corp. has provided an update from its chairman, Joseph Grosso. 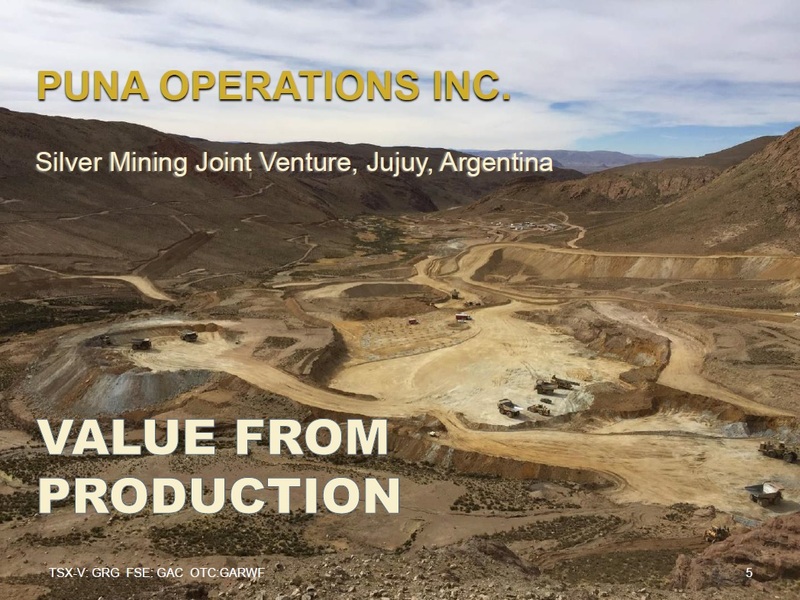 On November 9, 2018, Golden Arrow Resources Corp.'s joint venture partner, Puna Operations Inc., has released the third quarter 2018 financial results for the joint venture, as well as provided an operational update on the Chinchillas silver-lead-zinc project in Argentina.